Corynebacterium glutamicum mycothiol peroxidase (MPx) is a novel CysGPx family peroxidase that uses both the mycoredoxin and thioredoxin reducing systems as proton donors for peroxide detoxification. In this study, we revealed that MPx is also important for cellular survival under acid stress. A Δmpx mutant exhibited significantly decreased resistance to acid stress and markedly increased accumulation of reactive oxygen species (ROS) and protein carbonylation levels in vivo. Overexpression of mpx increased the resistance of C. glutamicum to acid stress by reducing ROS accumulation. Elevated expression of the mpx gene was consistently observed when the C. glutamicum wild-type strain was exposed to acid stress conditions, which in turn directly contributed to tolerance to acid stress. The acid-induced expression of mpx was mediated by the stress-responsive extracytoplasmic function-sigma (ECF-σ) factor, SigH. The results unequivocally show that MPx is essential for combating acid stress by reducing intracellular ROS levels induced by acid stress in C. glutamicum, which adds a new dimension to the general physiological functions of CysGPx. Mycothiol peroxidase, Acid stress, ROS, SigH, Corynebacterium glutamicum. Microbial fermentation production of biological products, such as biofuel, bio-based chemicals and biological materials, has attracted increased attention worldwide. However, during fermentation, most industrial bacteria are inevitably exposed to acid stress during production of acidic compounds and raw material pretreatment [1-3]. To survive acid stress, bacteria adopt a variety of acid-resistant mechanisms, including restriction of proton entry, expulsion of intracellular protons, production of macromolecular protection proteins and chaperones, and neutralization of the cytoplasm [4-8]. However, acid stress responses have mainly been studied in highly acid-resistant Gram-negative enteric pathogens, such as Escherichia coli and Salmonella that encounter the extremely low pH of the stomach during ingestion , and in a select number of Gram-positive bacteria, such as lactic acid bacteria and Listeria monocytogenes, that usually persist in acid environments [10-11]. Acid adaptation mechanisms central to the growth and survival of acid-sensitive bacteria of ecological and biotechnological importance are not well-understood. Corynebacterium glutamicum is a fast growing soil bacterium widely used for industrial production of amino acids and nucleotides [12,13]. Recent studies have focused on this organism for the production of other bio-based chemicals from renewable and eco-efficient lignocellulosic biomass, such as biofuels (isobutanol and ethanol), the diamines cadaverine and putrescine, the sugar alcohol xylitol, gamma-amino butyric acid, polyhodroxybutyrate, and organic acids [14-18]. Its sensitivity towards acidic pH is known, but the mechanism of pH homeostasis and the components participating in the acclimatization process are not well-known. Available information is limited to F1F0-ATPase, encoding the atp gene cluster, being down-regulated upon exposure to low pH and induction of the acid tolerance response, including the up-regulation of genes encoding transcriptional regulators and proteins responsible for transportation and metabolism. Additionally, the genes encoding glutamate decarboxylase, arginine decarboxylase and arginine deiminase, which represent another widely distributed acid resistance mechanism through alkalization of the cytoplasm, are missing in C. glutamicum . Therefore, there should be other novel acid adaptation mechanisms in the acid-sensitive C. glutamicum that deserve to be investigated. Recent studies on the acid stress response in C. glutamicum based on the transcriptome, proteome and metabolome unraveled a functional link between pH acclimatization, oxidative stress, iron homeostasis, and metabolic alteration . The occurrence of oxidative stress under acid stress was also observed in Bacillus cereus, accompanied by the formation of ROS and activation of oxidative stress-associated genes, such as thioredoxin, catalase and superoxide dismutase (SOD) [21-22]. However, although elimination of acid-induced H2O2 by the addition of external catalase facilitates the growth of C. glutamicum at neutral pH, addition of catalase has no significant beneficial effect on growth in acidic pH conditions . This observation raised the question of whether and how other enzymatic antioxidants, such as mycothiol peroxidase (MPx), function in the adaptation of C. glutamicum to acidic pH conditions. MPx is a novel CysGPx family peroxidase that degrades hydrogen peroxide and alkyl hydroperoxides in the presence of either the thioredoxin/thioredoxin reductase (Trx/TrxR) or mycoredoxin 1/mycothione reductase/mycothiol (Mrx1/Mtr/MSH) reducing systems. MPx protects against the damaging effects of ROS induced by multiple stressors and has higher catalytic efficiency than catalase or Ohr [23-25]. Expression of mpx significantly enhanced the resistance of C. glutamicum to various peroxides by decreasing protein carbonylation and intracellular ROS accumulation [30(25)]. The expression of mpx was directly regulated by the stressresponsive extracytoplasmic function-σ (ECF-σ) factor SigH , which was reported to increase the resistance of C. glutamicum to multiple stresses and regulate the expression of many oxidative stress-resistance genes [26-28]. In this study, we reveal for the first time that MPx is also crucial for cellular survival under low pH conditions, acting by scavenging ROS induced by acid stress. Our work provides insight into a previously unknown, but important, aspect of the C. glutamicum cellular response to acid stress. Our results will aid in the understanding of acid tolerance mechanisms in acid-sensitive bacteria and open a new avenue to improving acid resistance in industrial strains for the production of bio-based chemicals from renewable biomass. Bacterial strains and culture conditions: Bacterial strains and plasmids used in this study are listed in Table S1. C. glutamicum and E. Coli strains were aerobically cultured in Luria-Bertani (LB) broth on a rotary shaker (220 rpm) or on LB plates at 30°C and 37°C, respectively. When needed, antibiotics were used at the following concentrations: chloramphenicol, 20 μg/ ml for E. Coli and 10 μg/ml for C. glutamicum; kanamycin, 50 μg/ml for E. Coli and 25 μg/ml for C. glutamicum; nalidixic acid, 40 μg/ml for C. glutamicum. Table S1: Bacterial strains, plasmids and primers used in this study. Acid survival assays: Acid survival assays were performed according to the method by Zhang et al. with minor modifications, as follows: Overnight cultures of C. glutamicum strains in LB were appropriately diluted into LB (different pH) and incubated at 30°C with shaking at 100 rpm for 1 h. After acid stress, the cultures were serially diluted and plated onto LB agar plates, and colonies were counted after 36 h growth at 30°C. Percentage survival was calculated as follows: [(CFU/ml after acid challenge)/ (CFU/ml without acid challenge)] × 100%. Measurement of intracellular ROS levels: To detect intracellular ROS, the fluorescent reporter dyes 3’-(p-hydroxyphenyl) fluorescein (HPF, Invitrogen) and 2′,7′-dichlorodihydrofluorescein diacetate (H2DCFDA, Invitrogen) were used, as previously described . Briefly, 1 ml of cells grown aerobically (A600=1.6) were collected, washed and resuspended in 1 ml 50 mM phosphatebuffered saline (PBS, pH 7.4) prior to pre-incubation with 10 mM HPF or H2DCFDA at 28°C in the dark for 20 min. The cells were then pelleted, washed twice with 50 mM PBS, resuspended in 1 ml LB (pH 4.0), and incubated for 1 h in the dark. After that, 200 ml of the resultant cell suspension samples were transferred to a black 96-well plate. Fluorescence was measured using a SpectraMax M2 Plate Reader (Molecular Devices) with excitation/emission wavelengths of 490/515 nm (HPF) and 495/520 nm (H2DCFDA). Determination of cellular protein carbonylation: Protein carbonylation assays were performed based on the method described by Vinckx et al. with minor modifications. Briefly, C. glutamicum strains were grown overnight in LB medium and treated at pH 4.0 for 1 h with shaking at 100 rpm at 30°C. Cultures were then collected by centrifugation, washed with 25 mM Tris-HCl (pH 8.0) and resuspended in 25 mM Tris-HCl (pH 8.0) containing protease inhibitor cocktail (Sigma-Aldrich, Taufkirchen, Germany). Sonication was performed to obtain a clear cell lysate. The soluble protein fraction was collected by centrifugation and concentration was measured using the Bradford assay according to the manufacturer’s protocol (Bio-Rad, Hercules, CA) with bovine serum albumin (BSA) as a standard. Subsequently, protein carbonylation levels were measured with an OxyBlot Protein Oxidation Detection Kit (Millipore, MA, USA) according to the manufacturer’s instructions, which measures the carbonyl groups of proteins generated by oxidative reactions. Carbonyl groups in proteins were derivatized with 2,4-dinitrophenyl hydrazine (DNPH). Twenty micrograms of the DNPH-derivatized protein were loaded onto a 15% sodium dodecyl sulfate polyacrylamide gel electrophoresis (SDS-PAGE) gel and electrophoresis was conducted. After electrophoresis, derivatized proteins were electroblotted onto nitrocellulose membranes, and immunodetection of DNPH-derivatized proteins was performed using a rabbit anti-DNP antibody. Construction of chromosomal fusion reporter strains and β-galactosidase activity assay: The lacZ fusion reporter plasmid, pK18mobsacB-Pmpx::lacZ, was transformed into C. glutamicum wild-type (WT), Δ sigH(pXMJ19) and Δ sigH(pXMJ19- sigH) by electroporation, and the chromosomal pK18mobsacB-Pmpx::lacZ fusion reporter strain was selected by plating onto LBkanamycin plates . The resulting strains were grown in LB medium to an optical density at 600 nm (A600) of 0.9-1.0, and then treated under different pH conditions at 30°C for 30 min. β-galactosidase activity was assayed with o- nitrophenyl-β-galactoside (ONPG) as the substrate . Quantitative RT-PCR analysis: Total RNA was isolated from exponentially growing WT(pXMJ19), ΔsigH(pXMJ19) and ΔsigH(pXMJ19-sigH) strains exposed to different pH conditions for 30 min using the RNeasy Mini Kit (Qiagen, Hilden, Germany) along with the DNase I Kit (Sigma-Aldrich). Purified RNA was reverse-transcribed with random 9-mer primers and MLV reverse transcriptase (TaKaRa, Dalian, China). Quantitative reverse transcription polymerase chain reaction (qRT-PCR) analysis was performed using a 7500 Fast Real-Time PCR System (Applied Biosystems, Foster City, CA) as described previously . The primers used for qRT-PCR analysis are listed in Table S1. The relative abundance of the target mRNAs was quantified based on the cycle threshold value. To standardize the results, the relative abundance of 16S rRNA was used as an internal standard. Statistical analysis: The results shown represent the mean of one representative assay performed in triplicate and error bars represent standard deviation (SD). Statistical analysis was carried out using Student’s t-test. Survival response of C. glutamicum to acid stress: The survival response of C. glutamicum to acid stress was studied using the wild-type strain treated with pH values ranging from pH 6.0 to pH 3.0 adjusted with HCl (Figure 1). Upon exposure to the different acid shocks, the survival rate of stationary phase wild-type C. glutamicum showed significant differences. At pH 6.0, the C. glutamicum survival rate was 100%. Upon exposure to pH 5.5, pH 5.0, pH 4.5, and pH 4.0, the C. glutamicum wild-type strain had survival rates of approximately 90%, 80%, 70% and 50% compared with untreated strains, respectively. This strain was unable to survive at a pH lower than pH 3.5, as shown by the inability to form colonies on LB plates incubated at 30°C for 36 h. This response is hereafter referred to as the inactivation phenotype and the condition as bactericidal. Figure 1: Physiological response of C. glutamicum upon exposure to different acidic pH levels. Wild-type C. glutamicum was grown in LB medium to an A600 of 1.6-1.7 and exposed to acidic pH at 30°C for 1 h. After treatment, the cultures were serially diluted, spread onto LB plates and incubated at 30°C for 36 h. Survival percentages were calculated as follows: [(CFU/ml with stress)/(CFU/ml without stress)] × 100. Mean values with standard deviations (error bars) from at least three repeats are shown. Acid stress-induced ROS formation in C. glutamicum: In Bacillus cereus, acid stress was reported to induce the production of deleterious reactive oxygen species (ROS), including the highly destructive hydroxyl radicals (OH·), which are generated via Fenton chemistry . This finding prompted us to investigate whether ROS are produced in C. glutamicum treated with low pH. Formation of ROS in C. glutamicum wild-type cells was examined after exposure to selected pH levels (pH 6.0, pH 5.5, pH 5.0, pH 4.5, pH 4.0, and pH 3.5) using the ROS-sensitive fluorescent probe, 2’,7’-dichlorofluorescein diacetate (H2DCFDA) (Figure 2A). C. glutamicum showed excess ROS formation corresponding to the survival rate observed at pH 5.5, pH 5.0, pH 4.5, pH 4.0, and pH 3.5. At pH 6.0, the pH at which this strain was unaffected, no excess ROS formation was measured. Moreover, the intracellular ROS levels increased as the pH values the cells were exposed to decreased (Figure 2A). Figure 2: ROS formation in C. glutamicum upon exposure to low pH. Quantification of intracellular ROS and OH· levels in C. glutamicum wild-type cultures after treatment at different acidic pH for 1 h with fluorescent probes H2DCFDA and HPF, respectively. Mean values with standard deviations (error bars) from at least three repeats are shown. *P ≤ 0.05. Next, we monitored the generation of hydroxyl radicals (OH·), the most toxic ROS produced upon acidic pH exposure, using the OH·-specific fluorescent probe, 3’-(p-hydroxyphenyl) fluorescein (HPF) (Figure 2B). Significantly higher amounts of OH· were observed in C. glutamicum wild-type cells treated with acid, and OH· production increased in response to the decrease in pH. Taken together, these data provide evidence that acid stress induced excess formation of ROS in C. glutamicum, which contributed to cell toxicity upon acid stress. MPx protects C. glutamicum cells against acid stress: To address whether MPx can protect C. glutamicum cells against acid stress, wild-type, Δ mpx mutant and complementary strains were challenged at pH 4.0 and 6.0 for 1 h, and survival rates were assessed using a cell viability assay (Figure 3). pH 4.0 treatment reduced the survival rate of the wild-type and led to a mortality rate of about 50% (Figure 1). As shown in Figure 3, while the survival rate of the Δ mpx mutant is nearly identical to the wild-type under pH 6.0 treatment, the survival rate of the Δ mpx mutant decreased by 37.9% compared to the wild-type under pH 4.0 treatment. However, the acid sensitivity phenotype of the Δ mpx mutant was completely rescued in the complementary strain Δmpx (pXMJ19-mpx). Moreover, mpx overexpression increased the resistance of the wild-type strain to acid stress (Figure 3). In addition, deletion of the mpx gene did not affect bacterial growth under normal conditions without acid stress (Figure S1), further supporting the conclusion that MPx plays protective role against acid stress in C. glutamicum. Figure 3: MPx was required for cellular resistance to acid stress in C. glutamicum. Indicated C. glutamicum strains were exposed to acid stress (pH 4.0 and 6.0) for 1 h at 30°C. Cell survival rate was measured by a viability assay. Mean values with standard deviations (error bars) from at least three repeats are shown. *P ≤ 0.05. Figure S1: Deletion of the mpx gene did not affect bacterial growth under normal conditions without acid stress. The growth of the indicated strains in LB was monitored by measuring OD600 at indicated time points. Data shown were the average of three independent experiments; error bars indicate SD from three independent experiments. 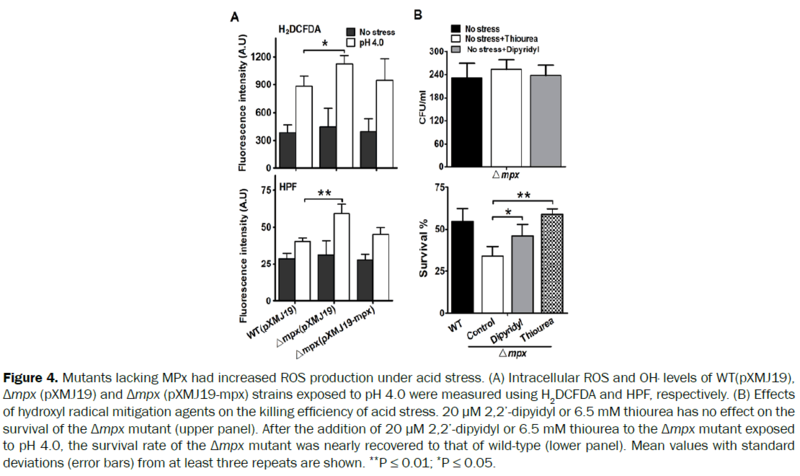 MPx is able to reduce intracellular ROS levels produced under acid stress: The above data demonstrated that acid stress can induce oxidative stress and lead to ROS production in C. glutamicum. Interestingly, it was reported recently that MPx plays important role in resistance to oxidative stress generated by multiple stressors and in scavenging ROS in C. glutamicum [23,25]. These findings prompted us to examine whether the acid stress tolerance in C. glutamicum conferred by MPx was associated with a reduction in the levels of deleterious ROS induced by acid stress. We thus examined intracellular ROS and OH· levels after acid stress treatment with H2DCFDA and HPF, respectively. The data revealed that, as expected, the Δ mpx mutant had markedly higher ROS and OH· levels than the wild-type strain at pH 4.0 (Figure 4A). ROS and OH· levels in the complementary strain, Δ mpx (pXMJ19-mpx), were almost completely reduced to the level of the wild-type strain (Figure 4A), indicating that mpx is strongly linked to ROS scavenging in the mutant. These data suggest that MPx protects C. glutamicum against acid stress by scavenging ROS, especially the highly toxic OH·, produced via Fenton chemistry under acid stress. Thus, we speculate that the survival rate of Δ mpx mutants is restored to the wild-type level under acid stress by blockage of the Fenton reaction-mediated hydroxyl radical formation by 2,2’- dipyridyl or thiourea, agents known to effectively mitigate the damaging effects of hydroxyl radicals . As expected, when added to bacterial cultures challenged by acid stress, each of these two chemicals was able to increase the survival rates of Δ mpx mutants to levels almost comparable to those of wild-type strains (Figure 4B), further validating the notion that MPx is critical in removing deleterious ROS accumulated in C. glutamicum under acid stress conditions. Figure 4: Mutants lacking MPx had increased ROS production under acid stress. (A) Intracellular ROS and OH· levels of WT(pXMJ19), Δmpx (pXMJ19) and Δmpx (pXMJ19-mpx) strains exposed to pH 4.0 were measured using H2DCFDA and HPF, respectively. (B) Effects of hydroxyl radical mitigation agents on the killing efficiency of acid stress. 20 μM 2,2’-dipyidyl or 6.5 mM thiourea has no effect on the survival of the Δmpx mutant (upper panel). After the addition of 20 μM 2,2’-dipyidyl or 6.5 mM thiourea to the Δmpx mutant exposed to pH 4.0, the survival rate of the Δmpx mutant was nearly recovered to that of wild-type (lower panel). Mean values with standard deviations (error bars) from at least three repeats are shown. **P ≤ 0.01; *P ≤ 0.05. ROS escaping from the antioxidant defense system are more apt to react with the cysteine thiol groups of proteins, resulting in irreversible sulfoxidation products, inter- or intra-protein disulfides (PrSSPr, PrSSPr), and mixed disulfides with low molecular weight thiol, and eventually lead to protein carbonylation [35,36]. Given that MPx is able to reduce ROS in C. glutamicum, we hypothesized that MPx may also function in protecting against protein carbonylation under acid stress conditions. To test this hypothesis, we applied a well-established method to measure protein carbonylation using the OxyBlot assay. Total proteins of the wild-type and Δ mpx mutant cells treated at pH 4.0 were extracted and subjected to SDS-PAGE before and after OxyBlot treatment (Figure 5). A high number of proteins were found to harbor carbonyl groups in C. glutamicum protein extracts of wild-type and Δ mpx mutant cells treated at pH 4.0. Furthermore, the carbonylation level of protein extracts was significantly lower in wild-type compared to the Δ mpx mutant after 1 h of exposure to pH 4.0 (Figure 5). Taken together, these data provide evidence that MPx plays protective roles against acid stress in C. glutamicum via removal of acid stress-induced ROS production. Figure 5: Mutants lacking MPx had increased protein carbonyl content under acid stress. Protein carbonyl content was analyzed by Western blotting with an anti-dinitrophenyl antibody (upper panel). A parallel run was stained with Coomassie Brilliant Blue (lower panel). Total proteins were extracted from wild-type and Δmpx mutant cells. Acid-induced mpx expression is mediated by SigH: We already showed that MPx is involved in scavenging cellular ROS induced by acid stress. We next performed RT-PCR and LacZ activity profiling to examine whether mpx expression responds to acid stress inducers at the transcriptional level. The LacZ activity of the Pmpx::lacZ chromosomal promoter fusion reporter in the C. glutamicum wild-type strain was quantitatively measured in bacterial cells either untreated or treated with pH 5.0 and pH 5.5 (Figure 6A). The level of mpx expression was increased by approximately 1.46- and 1.23-fold in the wild-type strain treated with pH 5.0 and pH 5.5, respectively, compared to untreated samples (Figure 6A). Further, expression of the Pmpx::lacZ fusion displayed a H+ concentration-dependent increase in response to acidic environmental conditions (Figure 6A). A similar H+ concentrationdependent pattern of mpx expression in response to acid stress was also observed in qRT-PCR analysis (Figure 6B). These results clearly demonstrate that acid stress induces mpx expression, which in turn directly contributes to the tolerance of C. glutamicum to acidic stress conditions. Figure 6: Positive regulation of C. glutamicum mpx expression by SigH under acid stress. (A) β-Galactosidase analysis of mpx promoter activities using the transcriptional Pmpx::lacZ chromosomal fusion reporter expressed in the indicated C. glutamicum strains. Mean values with standard deviations (error bars) from at least three repeats are shown. **: P ≤ 0.01. (B) qRT-PCR assay revealed that expression of mpx was under strict positi	ve regulation of SigH under acid stress. Exponentially growing C. glutamicum cells were exposed to pH 5.0 and pH 5.5 for 30 min. The levels of mpx expression were determined by quantitative RT-PCR. The mRNA levels are presented relative to the value obtained from wild-type cells without treatment. Mean values with standard deviations (error bars) from at least three repeats are shown. **P ≤ 0.01. As SigH, the stress-responsive extracytoplasmic function-sigma (ECF-σ) factor, was reported to respond to thiol-oxidative stress and regulate the expression of multiple resistance genes [27,28], we examined whether mpx expression was subjected to SigH regulation by measuring the transcription of chromosomal Pmpx::lacZ fusions. A significant decrease in LacZ activity was observed for the exponentially grown Δ sigH mutant exposed to pH 5.0 and pH 5.5 conditions for 30 min compared to the wild-type (Figure 6A). The reduced mpx expression in the ΔsigH mutant was fully recovered in the complementary strain Δ sigH (pXMJ19- sigH) under both acid-inducible and non-inducible conditions (Figure 6A). SigH-dependent mpx activation was also confirmed by qRT-PCR analysis (Figure 6B). These data suggest that SigH positively regulates the expression of mpx. C. glutamicum, a work horse in biotechnology for the production of amino acids and other bio-based chemicals, is an acidsensitive Gram-positive industrial bacterium [37,38]. Therefore, C. glutamicum is susceptible to acid stress, and enhancing the acid resistance of C. glutamicum is a key parameter during the fermentation process. Although the mechanisms of acid resistance have been well-described in multiple highly acid-resistant bacteria, including the roles of proton pumps, regulators, altered metabolism, protein and DNA repair, cell envelope alterations, and alkali production, most of these important general mechanisms are missing or ineffective in acid-sensitive C. glutamicum, indicating there may be some novel acid adaptation mechanisms in this bacterium. Recently, Mols et al. showed that the formation of acid stress-induced ROS may be a mechanism of cellular death in B. cereus exposed to low pH stress conditions, and that antioxidant enzymes, such as SOD and catalase, were significantly induced at low pH [21,22]. The study indicated that the primary ROS scavenging enzymes play a vital role in protecting cells from acid stressinduced oxidative stress. However, the content and activity of catalase are significantly reduced at acidic pH conditions, and alkylhydroperoxide reductase (Ahp) is missing in C. glutamicum, the two primaries H2O2 scavenging enzymes in bacteria . It was recently reported that MPx can protect against the damaging effects of ROS induced by multiple stressors and is a more efficient scavenger than catalase or Ohr, although the ability of MPx to protect C. glutamicum against acid stress remains unknown [23-25]. Here, we examined the physiological roles and underlying mechanisms of MPx in C. glutamicum under acid stress. As the main ROS scavenging enzyme in C. glutamicum, we speculated that the protective role of MPx against acid stress is correlated to its ability to scavenge ROS. The formation of ROS upon acid stress has been experimentally verified in B. subtilis. In addition, there are accumulating data demonstrating that exposure of microorganisms to various stresses, such as heavy metals, antibiotics, xenobiotics, heat, and salt can also increase the production of ROS and induce secondary oxidative stress [21,30,34,39]. As expected, acid stress induced the formation of ROS in C. glutamicum, and MPx-deficient mutants showed a significantly lower cell viability rate and more damaged protein carbonylation than the wild-type, owing to the loss of the ability to scavenge ROS (Figure 3). The physiological role of MPx in resistance to acid stress was also corroborated by the induced expression of MPx in C. glutamicum under acid stress, regulated directly by the stress-responsive ECF-sigma factor, SigH (Figure 6). These results strongly suggest that MPx expression is important for bacterial growth under acid stress. In conclusion, we described the role of MPx in the protection of C. glutamicum against acid stress through the reduction of intracellular ROS levels induced under acid treatment. To our knowledge, this is the first report describing the acid-resistant role of a mycothiol peroxidase. Hence, our work provides insight into a previously unknown, but important, aspect of cellular response to acid stress that could be used to develop C. glutamicum as an efficient bio-based chemical production strain in the future. This work was supported by the National High Technology Research and Development Program of China (863 program, grant 2013AA102802), National Natural Science Foundation of China (Nos. 31270078 and 31500087), Key Science and Technology R&D Program of Shaanxi Province, China (2014K02-12-01) and the Opening Project of State Key Laboratory of Microbial Resource, Institute of Microbiology, Chinese Academy of Sciences (No. SKLMR-20120601). Ibraheem O and Ndimba BK. Molecular adaptation mechanisms employed by ethanologenic bacteria in response to lignocellulose-derived inhibitory compounds. Int J Biol Sci. 2013; 9: 598-612. Lee JY, et al. Adaptive evolution of Corynebacteriumglutamicum resistant to oxidative stress and its global gene expression profiling. BiotechnolLett. 2013; 35: 709-717. Nicolaou SA, et al. A comparative view of metabolite and substrate stress and tolerance in microbial bioprocessing: From biofuels and chemicals, to biocatalysis and bioremediation. Metab Eng. 2010; 12: 307-331. Chang YY and Cronan JE. Membrane cyclopropane fatty acid content is a major factor in acid resistance of Escherichia coli. MolMicrobiol. 1999; 33: 249-259. Macpherson N, et al. Plasma membrane H+ and K+ transporters are involved in the weak-acid preservative response of disparate food spoilage yeasts. Microbiology. 2005; 151: 1995-2003. Sakoh M, et al. Proteolytic activity of HtpX, a membrane-bound and stress-controlled protease from Escherichia coli. J Biol Chem. 2005; 280: 33305-33310. Zhang J, et al. Glutathione protects Lactococcuslactis against acid stress. Appl. Environ. Microbiol. 2007; 73: 5268-5275. Zuniga M, et al. Structural and functional analysis of the gene cluster encoding the enzymes of the arginine deiminase pathway of Lactobacillus sake. JBacteriol. 1998; 180: 4154-4159. Richard HT and Foster JW. Acid resistance in Escherichia coli. Adv. Appl. Microbiol. 2003; 52: 167-186. Ryan S, et al. Acid stress responses in Listeria monocytogenes. AdvApplMicrobiol. 2008; 65: 67-91.
van de Guchte M, et al. Stress responses in lactic acid bacteria. Antonie van Leeuwenhoek. 2002; 82: 187-216. Kelle R, et al. L-Lysine production: Handbook of Corynebacteriumglutamicum. 2005; Taylor & Francis Group, Boca Raton, FL,p. 465–485. Kimura E. L-Glutamate production: Handbook of Corynebacteriumglutamicum. 2005; Taylor & Francis Group, Boca Raton, FL,p. 439–464. Blombach B, et al. Corynebacteriumglutamicum tailored for efficient isobutanol production. Appl EnvironMicrobiol. 2011; 77: 3300-3310. Kind S and Wittmann C. Bio-based production of the platform chemical 1,5-diaminopentane. ApplMicrobiolBiotechnol. 2011; 91: 1287-1296. Mimitsuka T, et al. Metabolic engineering of Corynebacteriumglutamicum for cadaverine fermentation. Biosci BiotechBioch. 2007; 71: 2130-2135. Schneider J and Wendisch VF. Putrescine production by engineered Corynebacteriumglutamicum. ApplMicrobiolBiotechnol. 2010; 88: 859-868. Smith KM, et al. Engineering Corynebacteriumglutamicum for isobutanol production. ApplMicrobiolBiotechnol. 2010; 87: 1045-1055. Kalinowski J, et al. The complete Corynebacteriumglutamicum ATCC 13032 genome sequence and its impact on the production of L-aspartate-derived amino acids and vitamins. JBiotechnol. 2003; 104: 5-25. Follmann M, et al. Functional genomics of pH homeostasis in Corynebacteriumglutamicum revealed novel links between pH response, oxidative stress, iron homeostasis and methionine synthesis. BMC Genomics. 2009; 10. Mols M and Abee T. Bacillus cereus responses to acid stress. EnvironMicrobiol. 2011; 13: 2835-2843. Mols M, et al. Analysis of acid-stressed Bacillus cereus reveals a major oxidative response and inactivation-associated radical formation. EnvironMicrobiol. 2010; 12: 873-885. Pedre B, et al. The Corynebacteriumglutamicummycothiol peroxidase is a reactive oxygen species-scavenging enzyme that shows promiscuity in thiol redox control. MolMicrobiol. 2015; 96: 1176-1191. Nystrom T. Role of oxidative carbonylation in protein quality control and senescence. EMBO J. 2005; 24: 1311-1317. Si M, et al. Functional characterization of a mycothiol peroxidase in Corynebacteriumglutamicum that uses both mycoredoxin and thioredoxin reducing systems as proton donor for oxidative stress response. Biochem J. 2015; 469: 45-57. Busche T, et al. Transcriptional regulation of the operon encoding stress-responsive ECF sigma factor SigH and its anti-sigma factor RshA, and control of its regulatory network in Corynebacteriumglutamicum. BMC Genomics. 2012; 13: 445. Ehira S, et al. Regulation of Corynebacteriumglutamicum heat shock response by the extracytoplasmic-function sigma factor SigH and transcriptional regulators HspR and HrcA. J. Bacteriol. 2009; 191: 2964-2972. Kim TH, et al. Functional analysis of sigH expression in Corynebacteriumglutamicum. BiochemBioph Res Co. 2005; 331: 1542-1547. Zhang W, et al. A type VI secretion system regulated by OmpR in Yersinia pseudotuberculosis functions to maintain intracellular pH homeostasis. EnvironMicrobiol. 2013; 15: 557-569. Wang T, et al. Type VI secretion system transports Zn2+ to combat multiple stresses and host immunity. PLoSPathog. 2015; 11: e1005020. Vinckx T, et al. A proteome analysis of the response of a Pseudomonas aeruginosa oxyR mutant to iron limitation. Biometals. 2011; 24: 523-532. Si MR, et al. NrdHredoxin enhances resistance to multiple oxidative stresses by acting as a peroxidase cofactor in Corynebacteriumglutamicum. Appl EnvironMicrobiol. 2014; 80: 1750-1762. Miller JH. A short course in bacterial genetics: a laboratory manual and handbook for Escherichia coli and related bacteria. Cold Spring Harbor Laboratory Press, New York. 1992. Kohanski MA, et al. A common mechanism of cellular death induced by bactericidal antibiotics. Cell. 2007; 130: 797-810. Ying J, et al. Thiol oxidation in signaling and response to stress: detection and quantification of physiological and pathophysiological thiol modifications. Free Radical Bio Med. 2007; 43: 1099-1108. Barriuso-Iglesias M, et al. Response of the cytoplasmic and membrane proteome of Corynebacteriumglutamicum ATCC 13032 to pH changes. BMC Microbiol. 2008; 8: 225. Jakob K, et al. Gene expression analysis of Corynebacteriumglutamicum subjected to long-term lactic acid adaptation. JBacteriol. 2007; 189: 5582-5590. Carmel-Harel O and Storz G. Roles of the glutathione- and thioredoxin-dependent reduction systems in the Escherichia coli and Saccharomyces cerevisiae responses to oxidative stress. Annu RevMicrobiol.2000; 54: 439-461.